Manchester City will prioritise the Champions League above their FA Cup fifth-round tie at Chelsea on Sunday, according to boss Manuel Pellegrini. City play the first leg of their Champions League last-16 match at Dynamo Kiev on Wednesday, four days before the Capital One Cup final. The Chilean said: "The priority is always the next game, but we must make an exception because of many injuries." City's visit to Chelsea will be shown live on BBC One on Sunday at 16:00 GMT. The 2011 FA Cup winners are still in contention to a complete an unprecedented quadruple by winning the Premier League, League Cup, FA Cup and Champions League. They will have to play a game in each competition in an 11-day span between 21 February and 2 March. 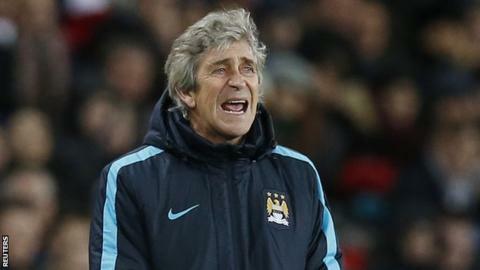 Pellegrini added: "We have just 13 players available to play and have to play the Champions League on Wednesday. We'll see the best team we can play on Sunday. "I always try to play with a strong team in every competition. They are all important but we must prioritise the Champions League." Chelsea, who are currently 12th in the Premier League, played their Champions League first-leg tie away to Paris Saint-Germain on Tuesday. Interim manager Guus Hiddink, who won the FA Cup during his previous spell in charge in 2009, said: "We have a serious approach to the FA Cup." Chelsea skipper John Terry has been ruled out of the tie.